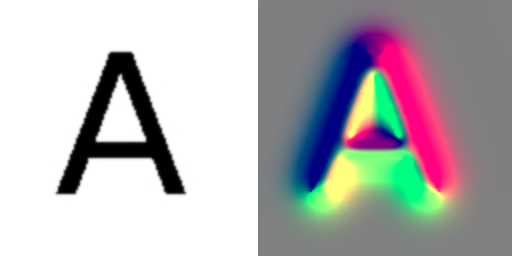 Here \(\alpha \in [0,1]\) is a weighting parameter between the intensity and the curvature term. The parameters T and \(\epsilon\) are used to drive to contour toward voxels with intensity in the range \(I \in [T-\epsilon,T+\epsilon]\). Level set surface moving in the image plane. The red circles show the zero level set at various time steps. 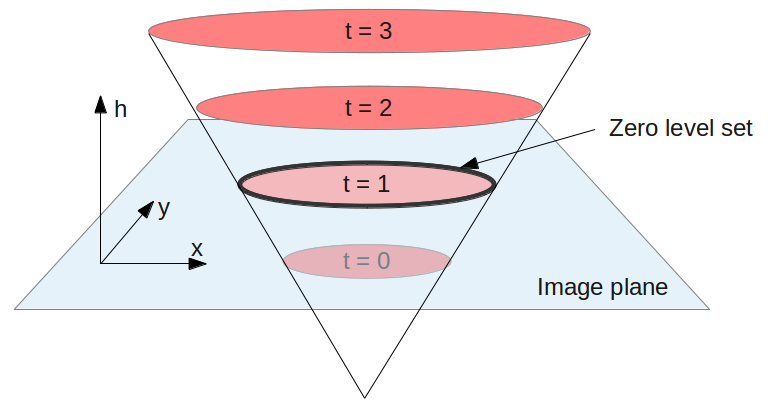 As time goes, the surface is moved down through the image plane and the zero level set change according to the shape of the surface. The level set method is very computationally expensive because each voxel has to be updated for each iteration. However, each voxel can be updated in parallel using the same instructions, making level sets ideal for GPUs (see [2,3,4] for details on different GPU implementations). I have created a simple GPU accelerated version of level set volume segmentation using OpenCL. 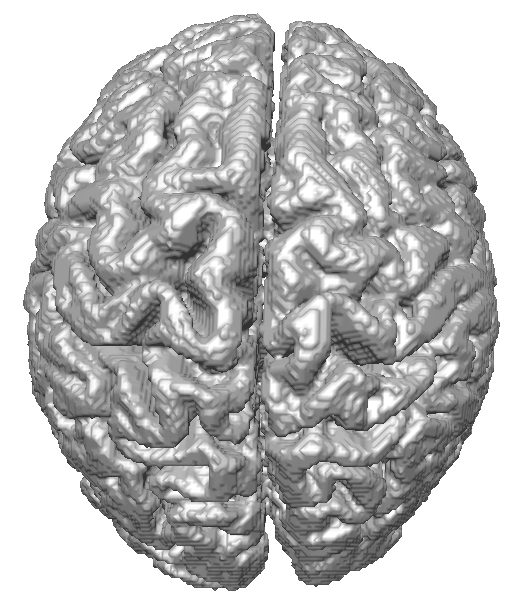 The implementation uses 3D textures on the GPU to reduce memory access latency.  Read more on textures in OpenCL my previous post on Gaussian Blur using OpenCL. If you want to look into further optimizing the level set computation you should look into the narrow band, sparse field or fast marching methods (see  for more details). The level set gradient \(\nabla \phi\) and the curvature \(\kappa\) has to approximated numerically. This can be done using the upwinding scheme. The level set function has to be initialized. It is common to initialize it to the distance transform which calculates the distance from each voxel to the initial contour. The signed distance is negative for voxels inside the initial contour and positive outside. If we use a spherical initial contour the signed distance transform can be easily calculated in parallel for each voxel using the following equation \(d = |\vec x – \vec c| – r\) where \(\vec x\) is the coordinate of the voxel, \(\vec c\) is the position of the center and r is the radius. The code is available on GitHub for download. The program uses the Simple Image Processing Library (SIPL) for loading, storing and displaying the volumes. This library is dependent on GTK 2. 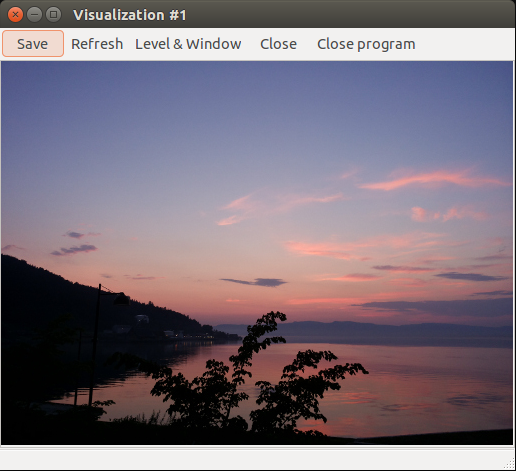 Below are a set of commands for downloading, compiling and running the example on Ubuntu. 4. Roberts, M., Packer, J., Sousa, M. C., & Mitchell, J. R. (2010). A Work-Efficient GPU Algorithm for Level Set Segmentation. Proceedings of the Conference on High Performance Graphics. 123–132. When I try to execute the same code in the CPU (Intel), the program fails creating the context and launches this error: Failed to create an OpenCL context! Do I need to do something more? Most often this happens because OpenCL is not properly installed. If you are on linux, make sure that the .icd file is located in /etc/OpenCL/vendors, otherwise try to reinstall or at least verify that your installation works. Hi, Erik! Thanks for the quick response! The intel64.icd file is in the folder (I’m on Ubuntu). The example of the vector sum (available on this blog) worked normally. The error only occurs on this project.